I sometimes feel the need to remind folks that watches are not the sole dominion of Switzerland and possibly Germany. This is a "Japan Only" model from Seiko. This is (I hope) my next watch! It is something that I could realistically afford - and REALLY enjoy! Looking back it seems like a lifetime ago, and in many ways it was. My first real job after graduating from the U (University of Oregon) was teaching English in Japan, in what everyone assured me was a small town - Kasukabe. Now keep in mind that I was a Northern Youth from a tiny town in Ohio - population hovering around (if memory serves) 5,000 or so. I am guessing that either my memory is faulty, or the town experienced some sort of "boom" because the census lists the population around 8,292 as a 2011 estimate. So when I got off the train and looked around it felt like I was in the big city. I seem to recall population estimates of over 200 thousand or so. Anyway, Japan seemed the most amazing place to me. I mean yes, there were many of the same things that we had in the US, but of course many differences as well. I'll never forget my first meeting with a "talking toilet"! But what I also really liked about Japan was that tradition was not a "fad". Grandfathers, fathers and sons working together in the family business - making ramen the same way that it had been done for generations - maybe even all the way back to when another American barbarian arrived in Tokyo Bay to try and force some "cultural exchange" on them. I suspect that he probably left without a new watch as well. Some of the happiest memories I have are of that time and place - I met my wife Wendy there, and learned that in many ways, almost anything is possible so long as your willing to compromise and learn and accept that perhaps there are a dozen other ways to do things - and easily a million different points of view! 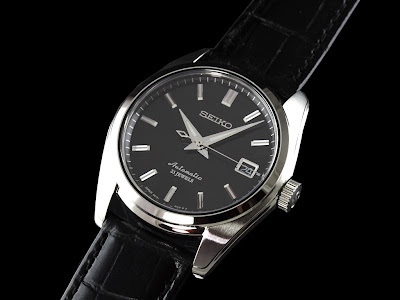 So I dream of Seiko - of this Seiko! And of my friends Obara-San and others.